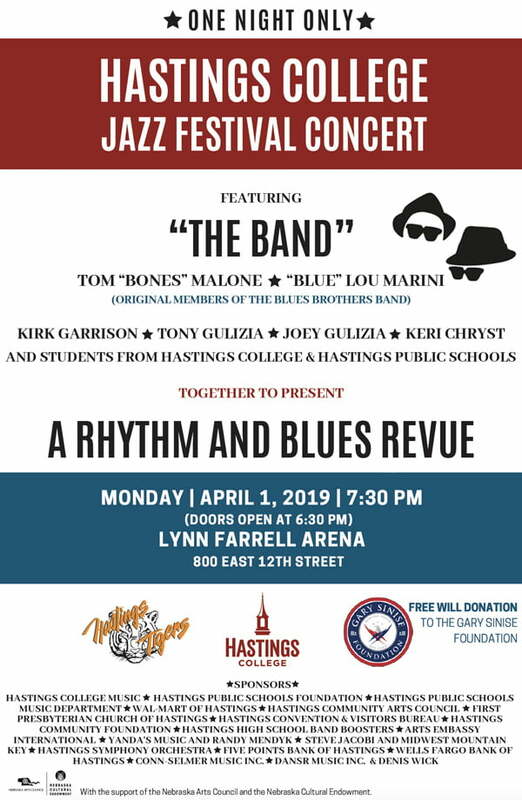 Musicians who were in the original Blues Brothers Band; the Saturday Night Live Band; and Blood, Sweat and Tears, and other top musicians from Nebraska, Chicago and Paris are headlining the Hastings College Jazz Festival Concert set for Monday, April 1 at 7:30 p.m. in Lynn Farrell Arena (800 E. 12th Street in Hastings). Thanks to the support of two-dozen sponsors, the concert is free and open to the public, with free will donations going to the Gary Sinise Foundation. Arena doors open at 6:30. The concert also features numerous local elementary, middle and high school groups, as well as the Hastings College Jazz Ensemble and a few other surprise musicians. The school and college groups will perform with the musicians, giving the school and college students a once-in-a-lifetime experience — and providing an exciting evening of music for those attending the concert. Thomas “Bones” Malone, an American jazz musician, arranger and producer who was a member of The Blues Brothers Band, Saturday Night Live Band, and a member of the CBS Orchestra (the house band for the Late Show with David Letterman). Malone currently plays with the Lt. Dan Band. “Blue” Lou Marini, one of the most sought after session horn players on saxophone, flute and clarinet. He’s been a member of Blood, Sweat and Tears, the Saturday Night Live Band, the Blues Brothers Band and his credits include hundreds of albums. Kirk Garrison is an active performer, educator and composer in the Chicago area. A veteran of the Chicago jazz scene, Kirk has played in the United States Air Force Band, and currently plays with the Lt. Dan Band. Joey Gulizia has been involved in music education for more 30 years and is a member of Nebraska Music Hall of Fame. He’s traveled the country and world as part of the Gulizia Brothers and Mannheim Steamroller. Tony Gulizia began his music career at the age of 8 working with his father, and, later, with Joey, his brother. In 1979, the talented musical duo Gulizia Brothers began working, in conjunction with the Nebraska Arts Council, in the Artists in Schools program. Keri Chryst, an international performer and educator, currently lives and works in Paris, France. Her spunky, authentic “in the pocket” swing and soulful groove earned her a reputation as a musician’s singer. Hastings High School Chamber Choir. Separate from the concert, the guest musicians are serving as clinicians April 1 for middle and high school bands who attend the Hastings College Jazz Festival during the day. Then, on the morning of Tuesday, April 2, students from the Festival can spend time in small groups meeting and working with the clinicians on campus. The afternoon of April 2 and morning of April 3, the guests will serve as Artists in Residence for Hastings Public Schools. As part of this program they’ll meet and work with fourth grade through high school students. Details can found at hastings.edu/jazzfestival. Kirk Garrison (trumpet) is an active performer, educator and composer in the Chicago area. A veteran of the Chicago jazz scene, Kirk attended Mankato State University before honing his skills in the United States Air Force Band. After leaving the Air Force in 1992, he completed his masters degree in Jazz Studies at DePaul University where he is now a member of the jazz faculty. He is also on faculty at Concordia University, Chicago. Garrison currently plays with the Lt. Dan Band.